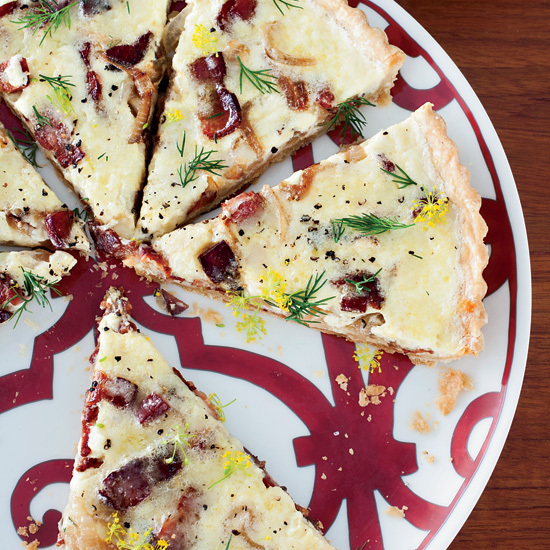 In the wide world of pies, savory versions are often forgotten. Left behind for sweeter confections like pumpkin pie or pecan pie, savory pies deserve recognition. After all, humans have been eating meat pies since at least the time of ancient Greece. The Romans mixed things up with seafood-filled pies. And in Medieval Europe cooks made "coffins," which unfortunately were not human-sized, but were filled with beef, lamb, duck or magpie (it turns out that blackbirds really were baked in pies). Ancient pie crusts weren’t always meant to be eaten—they were just a method of transporting the filling, but modern versions have the added benefit of flaky, buttery pastry. Here, F&W’s favorite savory pies including chef Jean-Georges Vongerichten’s tarte flambé-inspired quiche and F&W Best New Chef 2009 Kelly English’s mini Natchitoches meat pies.